After obtaining a BA and post-graduate Higher Diploma in Education, Captain Frank Charles van Rooyen, was a high school teacher in Pinetown and Hillcrest in the province of Natal for two years, whereafter he joined the SA Navy as a combat officer in 1980. He served on board various warships and in posts ashore, completing the required advance courses while he steadily climbed the promotion ranks. He attained the rank of Captain (SA Navy) a few years after completing the SA Navy’s Naval Command & Staff Course in 1995. In 2003 he represented the South African National Defence Force at the National Defence College in Kenya, obtaining an MA degree in International Studies from the University of Nairobi. 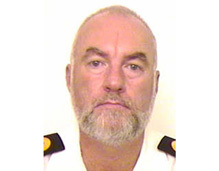 His last post in the SA Navy was that of Senior Staff Officer Maritime Strategy at South African Navy Headquarters. This included being the permanent Secretariat of the Standing Maritime Committee of the Southern African Development Community (SADC), as well as the Secretariat for the Sea Power for Africa Symposia in 2005 and 2009. In this capacity he has written a number of papers and delivered associated presentations in Africa and internationally. He joined the South African Institute of International Affairs in July 2009. He is part of SAIIA’s Emerging Powers (being the BRIC countries – Brazil, Russia, India and China) Programme. As the security research fellow, he focuses primarily in the intermediate period on analysing and understanding the BRICs’ security co-operation and interaction with African states, and he provides associated policy advice. He has commenced a PhD through the University of the Free State’s Centre for Africa Studies. The thesis deals with trilateral diplomacy - an analysis of the politico-security effects of co-operation between India, Brazil and South Africa. He is married to Sonica. Two children, Beverley and Robert Scott, from a previous marriage. They enjoy travelling, photography, camping, birdwatching. He has completed 5 Argus cycle tours, and they managed to climb Mount Kilimanjaro in September 2007.